I’m only guessing, but I think that anybody who wants to use Excel at an above average level, will have to learn at least a few keyboard shortcuts to get there. 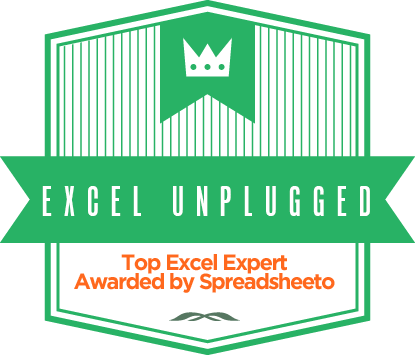 The math goes that the more shortcuts you know, the more efficient you are in Excel. So what does Word offer in the context of shortcuts that Excel does not? Well it can create a list of all its shortcuts for you. In Word press Alt+F8. 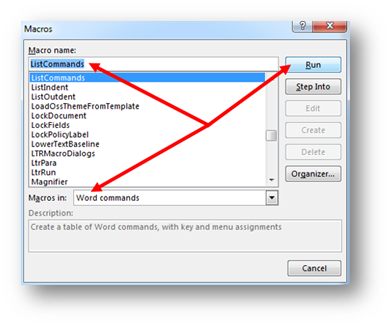 In the Macros window you first select Word Commands in the Macros in: dropdown. 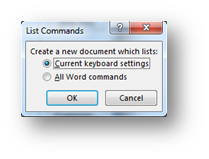 After that, you choose ListCommands from the list of Macros and choose Run. In the following window choose Current keyboard settings and press OK.
And what you get is a piece of brilliance. 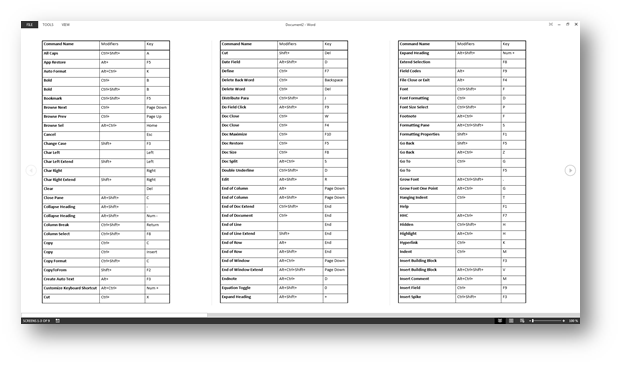 A new document that contains a list of all shortcuts that Word knows. Thanks for the posts – enjoying your blog! I use Word to change the case of text – without an additional column and formula. Copy text, paste in word, change case, copy and paste back. Although there are macros to do the same in Excel I don’t like that it clears the undo stack. Was interesting to read the comment and being an avid excel user, I have not really noticed. Most of my operations are based on learned experience. Thus I explored on Excel. My humble opinion: there might be more formulas than there are keys and the list would need to be so extensive that few will be able to make sense thereof. Subsequently everything is grouped under the heading of “Formulas”. Clicking on each of the given options (or then macros) it gives a description of what it is used for. Obviously you would need to have relevant backgroup to understand, but in principle I would think that with trial and error excercises and frequent use, one should be able to at least be able to manoevre a portion of the macros effectively.